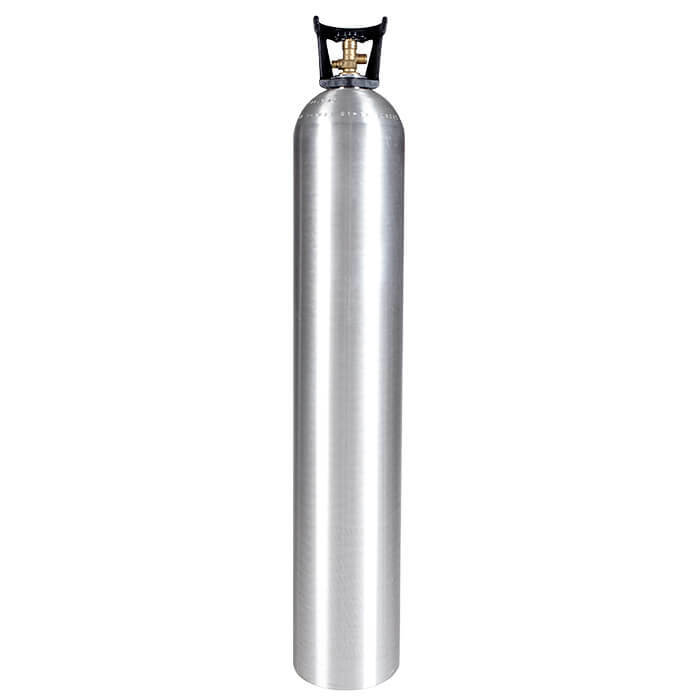 The new aluminum 50 lb CO2 cylinder with handle is the largest aluminum CO2 cylinder available today. Perfect for uses where large output and extended time between CO2 tank changes are essential. There’s no compromise in the features of this carbon dioxide cylinder. Precision, high-quality CGA320 valve comes preinstalled. A durable carry handle is also installed, for easy cylinder movement and valve protection. The quality is also throughout the construction. These cylinders feature thick-walled aluminum bodies, manufactured to exacting tolerances for long life and consistency, exceptional light weight in comparision to steel cylinders of the same size, natural corrosion resistance, and brushed aluminum exteriors. Applications include special effects, beer, soda, and carbonated beverage dispensing, hydroponic and aquarium use, and more.